"This function allows the users to standardized the major fees include: School Fees, School Fund, Hostel Fee, Transport Fee and Exam Fees. Term fees page would help define term fee codes to link to tuition groups. There should be 75 codes to define term fees for each fee type and for each month. 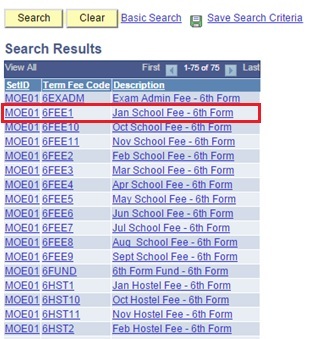 if the code defines Transport Fee for sixth form schools in the month of January, the code should be 6TRN1." 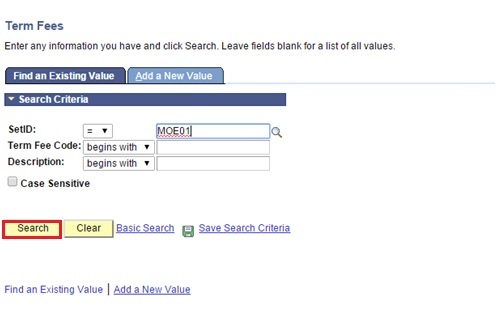 On the Find an Existing Value tab, enter MOE01 in the SetID field then click on the Search button. Select the relevant search result. You will be directed to the Term Fees page. On the Term Controls section, click on the (+) button to add another row. There are 5 tabs in the Term Fees page. a. 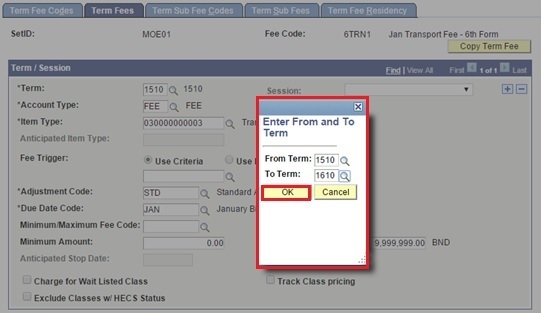 Term Fee Codes tab: The most generalized method of establishing rates for tuition and fees. The required fields include Status, Description, Charge By, Use and Fee Class. Click on Delete Term Fee button to remove any existing code. Note: The Status of the Term Fee has to be set to Active before it can be used for any billing processes. You cannot delete a term fee that is in use by an active tuition group. b. 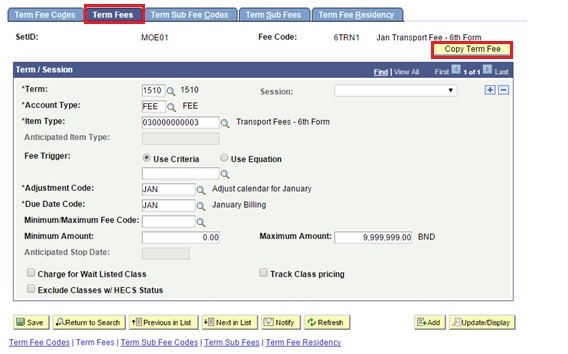 Term Fees tab: Term / Session section allows you to set the correct term and session for the type of fee in that particular month. The illustration below shows the arrangement for Transport Fee of Sixth Form schools in the month of January, Term 1510. The required fields include: Term, Account Type, Item Type, Adjustment Code and Due Date Code. Click on the Copy Term Fee button. A prompt Enter From and To Term box will appear. In the From Term field, enter the current term. Example, 1510 for Year 2015 Term 1. In the To Term field, enter the required term. Example, 1610 for Year 2016 Term 1. Note: In a term, the first two characters represent the year and the next two represent the term number. 1510 is 2015 term 1. If you are copying data from 1510, for the To Term, change only the year portion (i.e.15 to 16) to represent progression to next year. Ensure that the term number portion remains the same. Click on the OK button to add the new entry. Another row will be added and the details from the term 1510 will be automatically copied over to the new row for 1610. Save the changes by clicking on the Save button. Note: When a new term is set, the information from the previous term is copied over to all the tabs in the page; Term Sub Fee Codes, Term Sub Fees and Term Fee Residency.